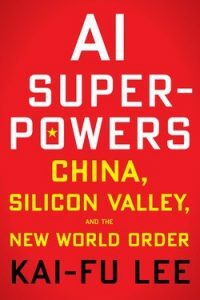 If you have the time to read only one book on artificial intelligence and the future of work, Kai-Fu Lee’s AI Superpowers: China, Silicon Valley & the New World Order should be the one. I purchased this book because I watched an interview with Dr. Lee and was struck by the quality of his character, which was more impressive than his AI and software credentials, which are quite impressive. Born in Taiwan and raised and educated in the United States, Dr. Lee lead speech recognition efforts at Apple, the creation of Microsoft’s research lab in China and then started Google’s efforts in China. Striking out on his own, he then started his own venture capital firm in Beijing, Sinovation Ventures, which has placed him at the heart of the Chinese entrepreneurial ecosystem, including the explosion in Chinese Internet development and applied AI. Dr. Lee compares the effort to develop AI in both China and the US. He argues that China is moving faster to develop and apply AI than the US, which is currently in the lead. On one hand, Dr. Lee is “talking his book.” On the other, he does an excellent job of helping his reader understand the Deep Learning aspects of AI as they are applied in business, enterprise and the economy – and how fast this change is accelerating. One of the key points of the book is that China and the US maintain significant leads in AI that have the potential to shift significant wealth from the rest of the world, further concentrating wealth in these two superpowers. Another is that the quality of AI Deep Learning applications are driven by the volume and richness of the data accessed. Whether efforts to force 5G or smart meters or to ionize the sky, there is a reason for the rapacious hunger for data as the US tries to generate richer data streams than China with it’s much larger population. One point Dr. Lee stresses several times is the power that China’s approach to mobile payments has added to the speed of innovation. A customer can make a direct bank-to-bank transfer with no fees on their mobile phone in China – leading to explosive growth in mobile payments and data flows. Whatever the pros and cons of a one party system, China’s leadership is less a prisoner of their financial industry than ours. Dr. Lee’s final section addresses approaches we should use both to apply and govern AI and ensure that the wealth and productivity generated serve to create a more loving society. His discussion of the policy issues and potential solutions is the most thoughtful I have read yet by someone in the field. The implementation of existing AI technology is moving quickly. It is impacting each one of us now. Dr. Lee’s book will help you understand what is happening and inspire you to explore with both heart and mind what it means in your life, your work and to those you love.